One Events are the industry-leading providers of event planning services in Madrid. 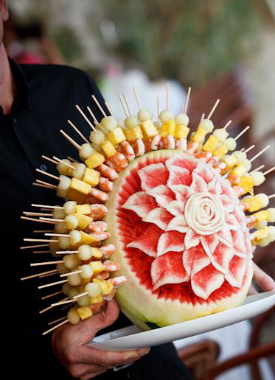 Specialists in planning and catering for events not only in Madrid but also in the Costa del Sol and throughout Spain. One Catering is not just one catering company in Madrid. We are much more than that, we are a wide-spanning network made from a team of professional caterers, suppliers, event planners, consultants, transport companies, lighting and sound experts, information technology experts, legal and financial advisors as well as event-planners who collectively have been working the Costa del Sol's largest and most successful events since 2001. If we know another company or an individual that can do the job better than we can, we will not hesitate for one moment to refer you to them. One Catering is not a fly-by-night operation, and we are perpetually improving our "happy client" list. It is our aim to make every client including you, a happy one. We offer a wide range of catering services and additional services ranging from personal chef catering of a romantic dinner for two to wedding catering (and planning) for groups of over 500 people. There is no event that is too big or too small for One Catering in Madrid. We also provide a 100% free, no-comittment quotation for your catering needs. As we are often on the move and are not always able to take notes, we always advise you to email us or use our contact form in the first instance. If you would like us to call you back immediately, please let us know and we will do so as soon as we are able to give you our 100% undivided attention. ** If you do not already have an event planner for the event you are looking to have catered, we would strongly advise against going it alone. Even if it is a small event, our event-planning services are second to none and our fees are very reasonable. In nearly every event that we have catered for over the past years, we have easily saved our clients far more money (by utilising our contacts, venues, know-how, etc.) than they have paid on our event planner fees.